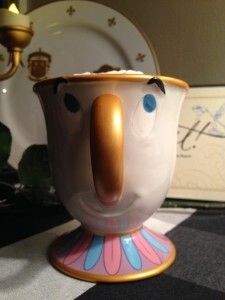 Today’s guest coffee mug comes from Jenny P ( @MrsJPotts). 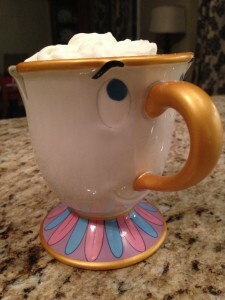 Jenny stated “I thought I would send you a picture of one of my favorite mugs for Mean Muggin’ Monday. 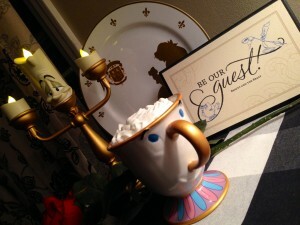 I have been wanting the Chip mug for a while now since my name is actually Mrs. Potts. We visited Walt Disney World three times last year and I could not find him! Luckily, my mother in law lives in Orlando and purchased him for me for Christmas at Downtown Disney. In these pictures, Chip is enjoying a cup of homemade hot cocoa from a local WV restaurant called Later, Gator”.